Houston’s Katy Taylor won the gold medal in the ladies event at the 2006 Four Continents Figure Skating Championships at the Broadmoor World Arena in Colorado Springs, Colorado. The event, which was the final international event leading up to the 2006 Olympic Winter Games in Torino, Italy, was Taylor’s first senior-level international event. She was in second place after the short program and placed second in the free skate with a total score of 164.05. Japan’s Yukari Nakano, the silver medalist, received a mark of 161.49, while Taylor’s U.S. teammate, Bebe Liang, captured the bronze medal with a score of 159.91. “I just wanted to go out there and do two good skates, and I did,” said Taylor. Twenty-three ladies took part in the free skate, including Christine Zukowski of the United States, who struggled to a score of 131.42 and a 10th-place finish. It looks like the young Houstonian is on track to making the 2010 Olympic team. (Lake Placid NY-January 17, 2006) The United States Bobsled and Skelton Federations have nominated Todd Hays, of Del Rio, Texas, to the United States Olympic Committee for consideration to the 2006 Winter Olympic Games in Turin, Italy. Hays will be making his third trip to the Games, after winning a silver medal as part of the four man bobsled team in 2002. He also competed in the two man event, placing fourth with teammate Garrett Hines. He finished the 2004-2005 season ranked ninth in the two man event, sixth in the four man event and seventh in the combined World Cup standings. He graduated from the University of Tulsa with a degree in physical education in 1994, after a stellar career in football. He was also the 1993 National Kickboxing champion. Hays will be joined on the team by Pavle Jovanovic (Tom’s River, NJ), Steve Mesler (Buffalo, NY), Brock Kreitzburg (Akron, OH), Steve Holcomb (Park City, UT), Bill Schuffenhauer (Salt Lake City, UT), Curt Tomasevicz (Shelby, NE), Lorenzo Smith III (Kankakee, IL) and Randy Jones (Atlanta, GA). (Lake Placid, NY-January 15, 2006) The United States Bobsled and Skeleton Federation have announced that Kevin Ellis of Dallas, Texas has been nominated in the sport of skeleton for the 2006 Winter Olympic Games in Turin, Italy. The United States Olympic Committee will review the nominations and make the final decision on his participation in the Games. Zach Lund, of Salt Lake City, Utah and Eric Bernotas of Avondale, Pennsylvania were also nominated to the team. As a result of the USA being ranked second overall in World Cup points, they were allowed to nominate three male athletes. All three men will be making their Olympic debut in Turin. Ellis, a graduate of Stephen F. Austin State University, began sliding in 1999. His best finish in a world class event was a second place finish in the America’s Cup race Calgary, Canada in November, 2004. Ellis uses his experience in track and field to give him an advantage at the start. He holds many start records in both the United Sates and around the world. He was ranked twenty-fourth in the world for the 2005 season. Katy Taylor, a junior at Katy’s Mayde Creek High School, finished in fourth place Saturday night at the U.S. Figure Skating Championships in St. Louis. She scored 103.85 points in the long program, giving her automatic bid to the 2007 Nationals and kept her on pace for a 2010 Olympic bid. Taylor skated well, but fell on her triple salchow and left out the second half of her closing triple lutz-double toe loop combination. “I came here wanting to have two good skates, and to be standing on the podium is just icing on the cake,” she said. Sasha Cohen took top honors with the score of 134.03, easily outscoring all other opponents, followed by Kimmie Meissner (116.01) and Emily Hughes (106.61). The evening had to be bittersweet for Hughes, who was bumped from the Olympic squad to make room for an injured Michelle Kwan. Kwan petitioned the U.S. Figure Skating Association for an injury waiver to compete in Turin. The waiver was granted, making Cohen, Meisssner, and Kwan the three women who will represent the United States at the Winter Olympic Games in February. However the fourth place finish for Taylor, who finished in ninth place at last year’s Nationals, improved her chances of representing the USA at the Olympics in four years in Vancouver. 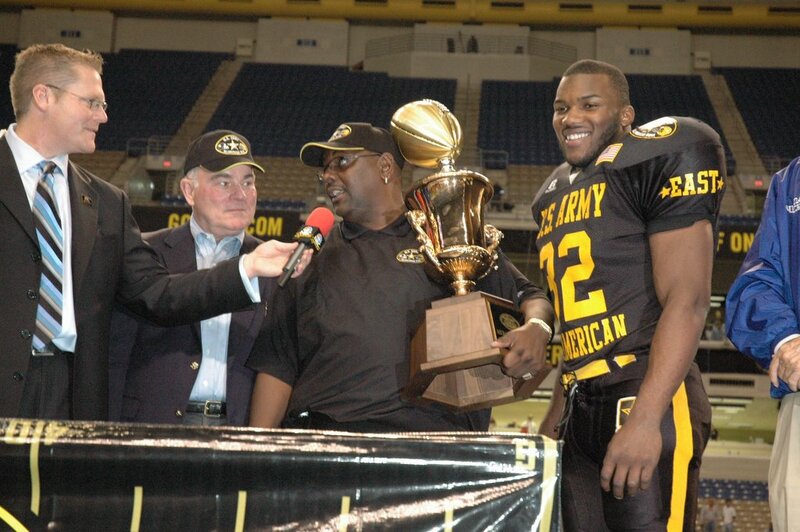 Scoring three touchdowns and rushing for 67 yards, Chris Wells lead the East squad to a 27-16 victory over the West squad in the 2006 U.S. Army All American Bowl at San Antonio’s Alamodome. Wells, a running back from Garland High School in Akron, Ohio, who was named the game’s Most Valuable Player, showed tremendous form and poise that will continue in the fall at Ohio State University. “We had a good week of practice,” Wells said. “We worked on goal-line a lot and the first time we got the ball today, I think we were in the red-zone pretty quick. We knew what we had to do and we went out and did it.”The East defense set the pace for the game, causing a fumble on the West’s first drive, which lead to the first score of the game for the East. The East put the game away in the fourth quarter when linebacker Brandon Graham blocked a field goal that was recovered by cornerback Raeshon McNeil and ran back for a touchdown. Wells, who showed the fans in attendance what they can expect to see from him at Ohio State next fall. Previous recipients of the award include California’s DeShaun Jackson, Ohio State’s Tedy Ginn, Jr., Florida’s Chris Leak and Chris Young of the University of Texas. Ben Johnson States "I am not a cheat"
It was reported today in the Victoria, Australia newspaper HERALD SUN that Canadian sprinter Ben Johnson stated he was framed for using performance-enhancing drugs at the 1988 Summer Olympic Games in Seoul, South Korea. Johnson ran 9.87 seconds to win the 100 meters, but he was disqualified and stripped of his gold medal after he tested positive for performance-enhancing drugs. One has to wonder why he is making that statement now, when its validity didn’t hold up eighteen years ago in Seoul. "People are evil. They will do anything to get rid of someone from the sport. I would say 40 per cent of people in sports are using performance-enhancing drugs. You would be surprised to see the great players of the past who retired doing stuff." It may be he is trying to rebuild his image. Perhaps he is trying to rewrite history to make his legacy more positive. One can never truly know what is in the mind of people. An unconfirmed report has just be announced on Sport Talk Radio 610AM in Houston that Houston Texans Head Coach Dom Capers will be fired tomorrow (Monday, January 2, 2006). What a surprise. There should be more that just he handed a pink slip. What about the GM and many of the assistants? And can we forget some of the players? Perhaps some trades are on the horizon? THE QUESTION!!! ARE THE TEXANS AND REGGIE BUSH A MATCH? The Houston Texans, by way of a New Year’s Day loss to the San Francisco 49ers, can earn the overall number one pick in the upcoming NFL draft. Many “experts” expect the Texans to select Heisman Trophy winner Reggie Bush. Others wonder if this is best route for the victory challenged Texans. Another option might be to trade away their number one pick and get two or three draft choices. Only time will tell what will happen, and by late evening on New Year’s Day, all with know if the Texans get the top pick. One thing is guaranteed. There will be major changes in Houston for next season, and those changes may include coaches, players, and front office staff. If Reggie Bush does become a Texans, then so be it. In any case, they need to find the right combination of talent, coaching and management to make this program work. After all, professional sports is about winning, and the Texans found little success at that in their brief history.